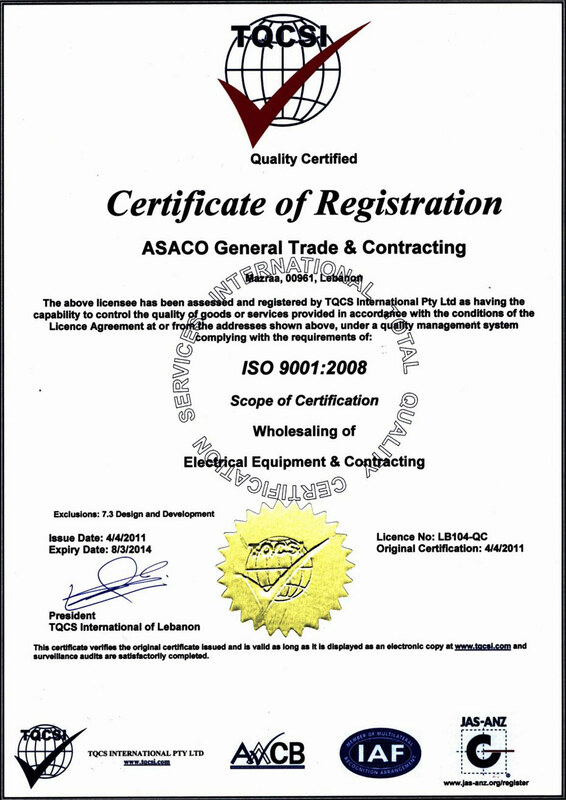 Continuous Development , Customer Satisfaction & Environmental Conservation is our Commitment, this is ASACO General Trade & Contracting policy an ISO certified company deep-rooted in the Renewable Energy Field. ASACO is by far the largest local integrator with the longest experience for the design, supply & installation of Renewable Energy systems since 1998 exceeding 1.5MW supplied or installed locally, Asaco has developed a manufacturing department specialized in mounting racks for photovoltaic solar panels capable to tailor the special requirements per each design whether it was installed on roof top, building façades or ground. Asaco is a local technical partner & an authorized dealer for famous brands in this filed such as Studer Innotech, SMA, Fronius , Schneider/ Xantrex, Circutor, Sunlight, CSun, BAE, Suntech, etc. The Company is ISO certified, the Quality department monitors all departments & assures that all are implementing quality procedures according to ISO9001. Is mainly responsible for the general trade as well as procurement where ASACO deals with & represents many reputable International vendors for electrical, security, Lighting and renewable energy appliances. The Contracting and Consultation Dept. Asaco is the Leader Company in the field of Renewable Energy & was the First to Supply & Commission projects in Lebanon related to this field. In addition to Supply & Commissioning Asaco offers studies & designs systems used in Renewable Energy with the best efficient energy measures per project as well as in usual Electrification Projects. Consultation is also very active in this department, which is responsible for the design and studies in the field of lighting and renewable energy system. This section is also responsible to set guidance and do proper supervision for subcontractors that are allocated by the company for certain projects and assignments. This department also provides contracting services for projects that adopt the company’s products, such as projects of X-mass decorative street lighting, Fiber Optics design, decoration, General Lighting & Electrification. This department was founded to manage the industrial facility fully owned by the Company. This facility consists of a 1500 Sq.M, fully utilized and contains production lines for GLS bulbs, customized Led light system, electronic circuits, plastic machinery and assembly line, tubular motors and RF remote control units, besides panel building for Renewable Energy Products. The factory produces about $1.0M per annum worth of products most of which are being sold in Lebanon and exported to neighboring countries. The factory started operation in year 2003. Further, Asaco is a shareholder in LUAS Lighting an Energy Saving Lamps factory founded in Zhejiang/China in 2010. In addition to the different projects for private sectors, Asaco has performed some green-energy related projects with international agencies & organizations such as UNIFIL, UNDP, MINURSO, UNLB & GTZ (German Development Cooperation) and has installed & supplied such systems to the Lebanese Internal Forces, The Industrial Research Institution & several other Lebanese municipalities with feasibility studies for such systems as well. Asaco cares much for the green energy environment & is represented therein by Mr. Ramzi AbuSaid the Project & Executive manager being the President of LSES, the Lebanese Solar Energy Society (a chapter of ISES International Solar Energy Society). Asaco is also playing an active role in campaigns for green energy awareness to spread this knowledge in mass communities such as Universities, colleges & exhibitions.